Escape To New York and Wildly Good Bucatini al Ragu – Inspired By Pasta Bought From Eataly and Of course ITALY! | Crappy Kitchen - Good Dinners! Escape To New York and Wildly Good Bucatini al Ragu – Inspired By Pasta Bought From Eataly and Of course ITALY! I escaped to New york City for 24 hours this week to soak up some much-needed cosmopolitan energy and culture. Being stuck in a provincial town as I am, I need to get away to satisfy that part of my that longs for something other than fields of cows, unexciting restaurants (an understatement! ), and generic big box clothing and food stores. To have such a wonderful city so close by is a glorious comfort when I need that jolt of stimulation. This trip was planned around not much more than where to have breakfast and where to have dinner while I visited my friend Bird on the Upper West Side. The worst thing you can do in a city like this when it comes to food is to wander the streets and hope you hit on something fabulous. This is a bad approach when it comes to any city, and yes, while it is true that you can stumble upon something great, you are more than likely to end up somewhere a little disappointing or lacking in one way or another. 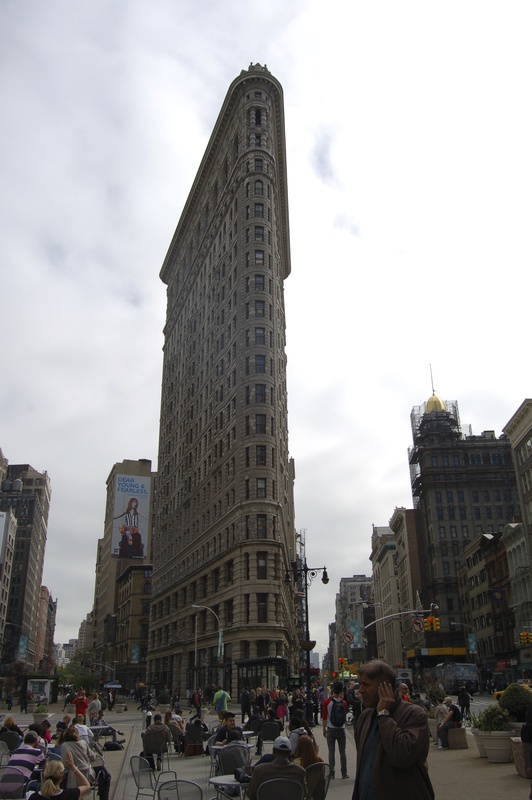 I lived in Manhattan for 8 years and have been visiting it ever since, and my friend has lived there over 20 years, so between the two of us the only problem we have is deciding between the great places we know and the great places we have heard about that are new. 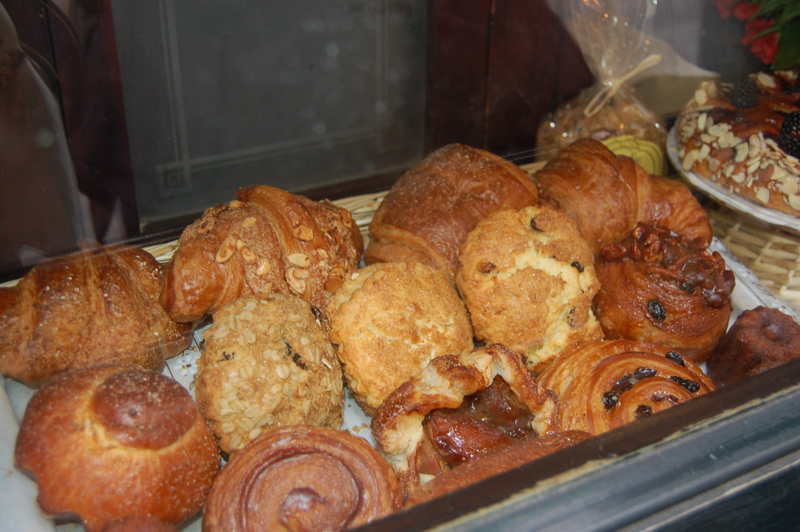 We settled on doing a bit of both, having coffee and sticky buns at Balthazar’s in Soho, and eating dinner at the pizza place in Eataly in the Flatiron District. 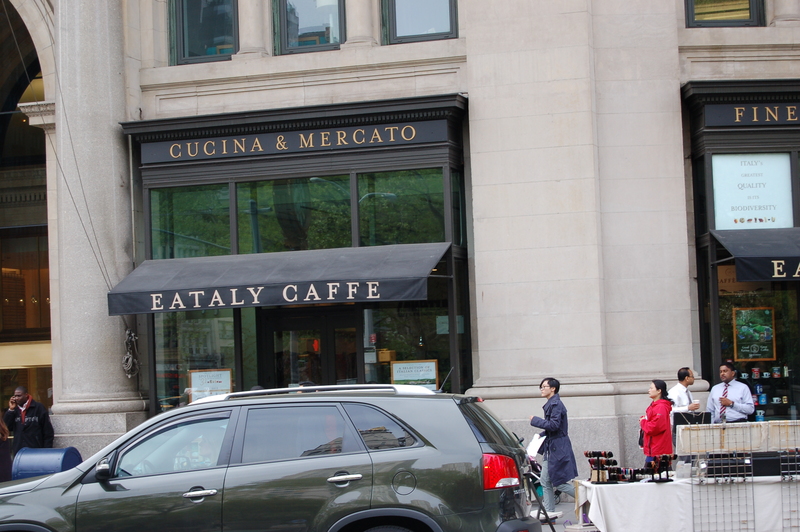 I had never been to the infamous Balthazar’s and I wanted to revisit Eataly (This giant marketplace is the result of the collaboration between two rock stars in the world of food, chefs Mario Batali and Lidia Bastianich – press here to read about my last Eataly visit) to buy pasta and see how the pizza there compared to all of the wonderful pizza I ate in Italy (click here for that story!) last year. 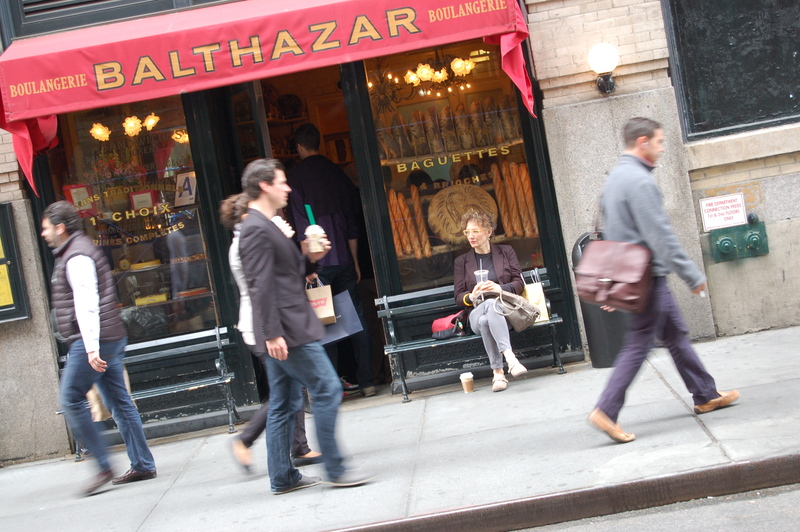 Suffice is to say that the coffee and pastry from Balthazar’s on Spring Street was divine and I am in shock as to know how I had never been there before? 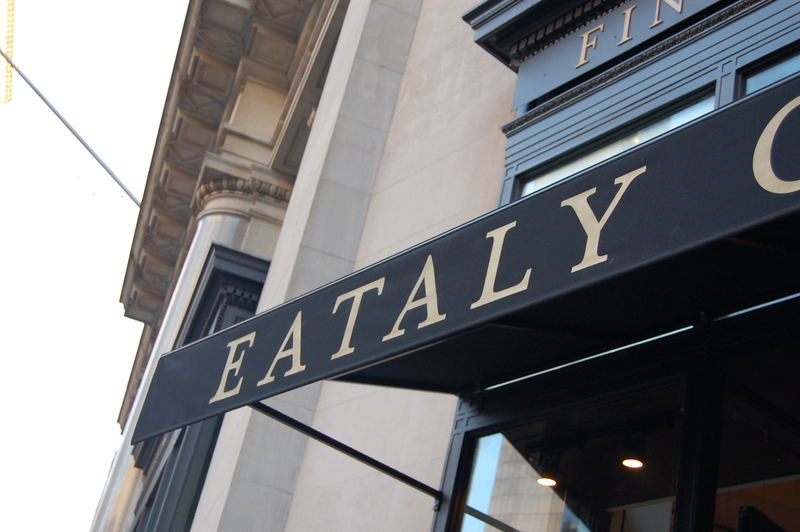 In between lunch and dinner was spent helping my friend shop for clothes in the cool boutiques in Soho before hopping on the R train for my Italian fix at Eataly. 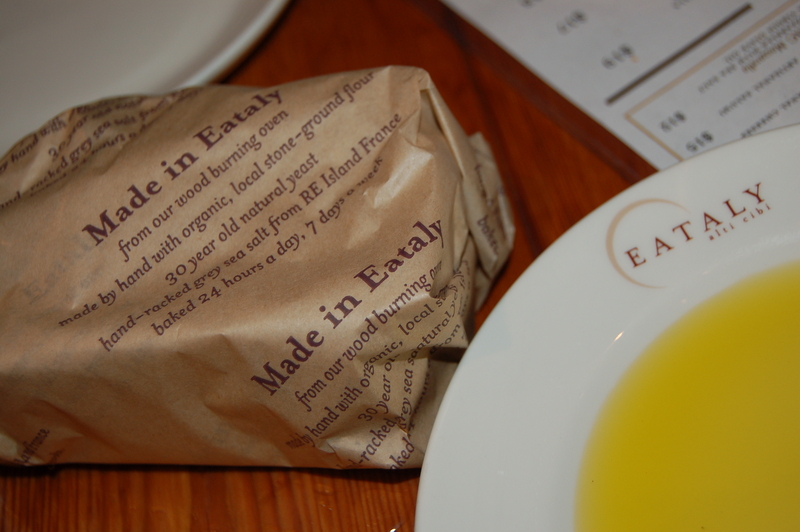 With time to kill before Pizza I took a gastronomic stroll through the many sumptuous displays of merchandise on offer in Eataly’s Market. 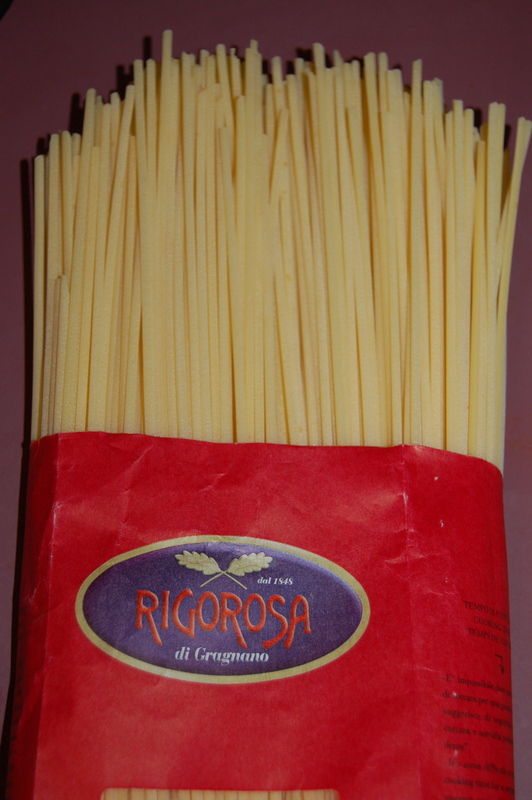 I bought some great dried pasta from a company called Rigorosa di Gragnano which hails from the town of Grangnano in the province of Naples. The pasta variety I choose was bucatini, which looks like a thick spaghetti but has a tiny hole running through the center. It is extruded through bronze dies giving the pasta a rough texture which is marvelous for sopping up thick sauces and has a lovely toothsome bite. 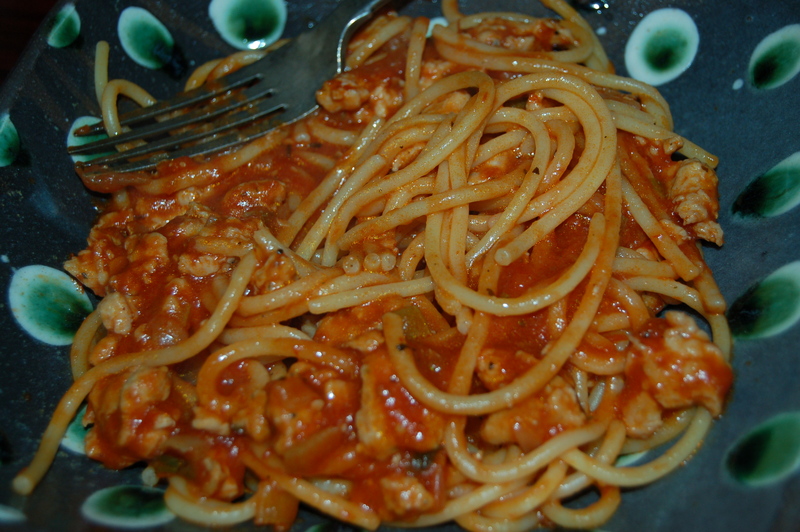 Of course the next day at home (last night) I had to cook it with just such a sauce, and it was heavenly (recipe below!). This pasta was really great and so worth it ($4.80 for 17.6 oz). My next visit will include more than 1 measly package! I also found a pear juice, Succo di Pera, that I had not seen since being in Italy last year, and even thought it was a woefully ridiculous price for a bottle of juice (nearly $7!) I had to buy one as it was the drink my daughter ordered every time we were in an enoteca or cafe (Which was quite often I’m happy to report). You should have seen her delighted face when I pulled it out of my bag when I arrived home. One would think I gave her permission not to do homework for a week! The pizza is classic Neapolitan style from their brick ovens, made with fresh mozzarella and San Marzano tomatoes. My pizza was scattered with artichokes, black olives and mushrooms, and, as big as it was, I ate the entire pie without a modicum of guilt! 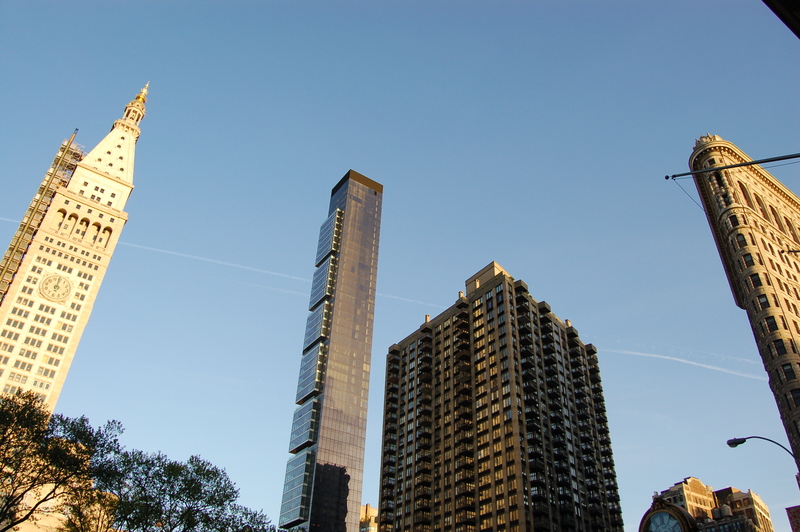 I returned thinking what I always think when I leave Manhattan: it was too short a trip. However I cannot even think about complaining as I am so lucky to have the chance to go there as often as I do. Stayed tuned for more vicarious visits to this wonderful city! 1 – Put large pot or deep saute pan (mine is 3″) on medium heat and add the oil. add the onions, celery and garlic and cook for about 8 minutes. Add the sausage to the pan, breaking it up with a wooden spoon when it is all in the pan. Cook for about 12 minutes, stirring frequently and breaking up meat into smaller pieces as it cooks. 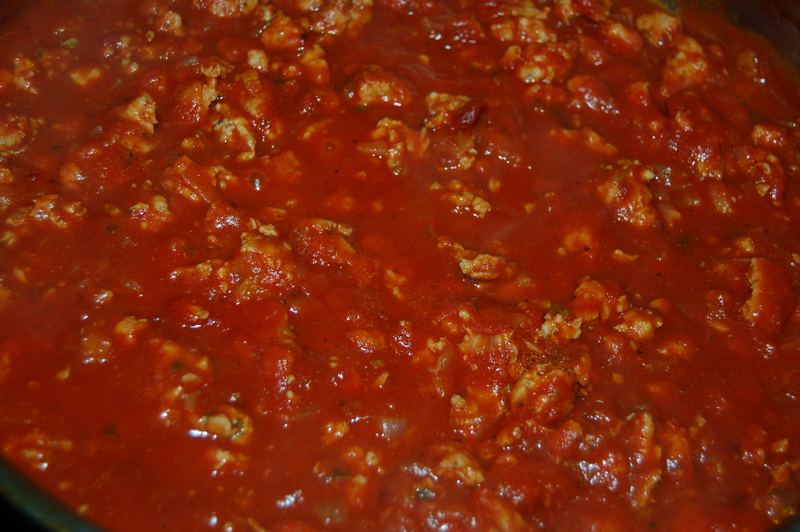 2 – Add the tomato paste, tomatoes and broth (or water & bouillon cube) to pan and turn heat up. Bring to a bubble, then turn down to a simmer (it should still “tremble” on top slightly). Add the salt, pepper flakes (if using), and several grinds of black pepper and stir. Cover with lid and cook for about 1 hour, stirring occasionally. Turn off sauce and taste for further addition of salt and pepper. Let it sit while pasta is cooking. 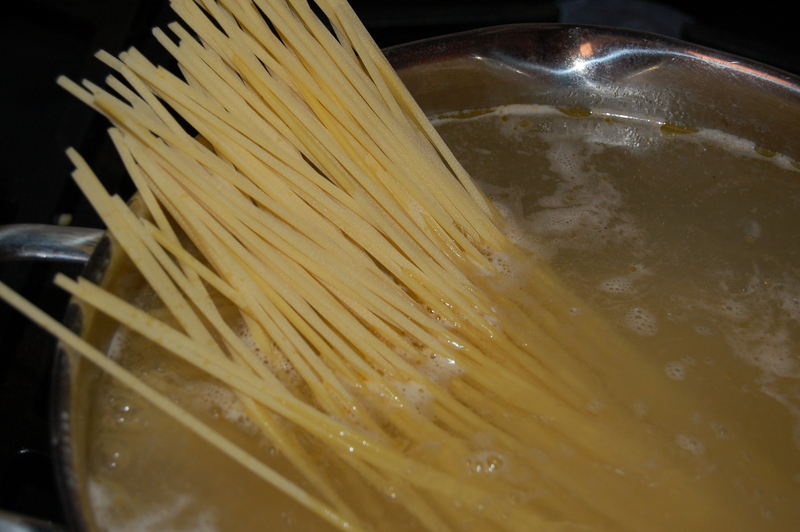 3 – Right before or right when you turn off your sauce, cook the pasta. When it is cooked, add drained pasta (not rinsed and remembering to reserve some pasta cooking water) to the sauce and stir. Toss everything together gently. 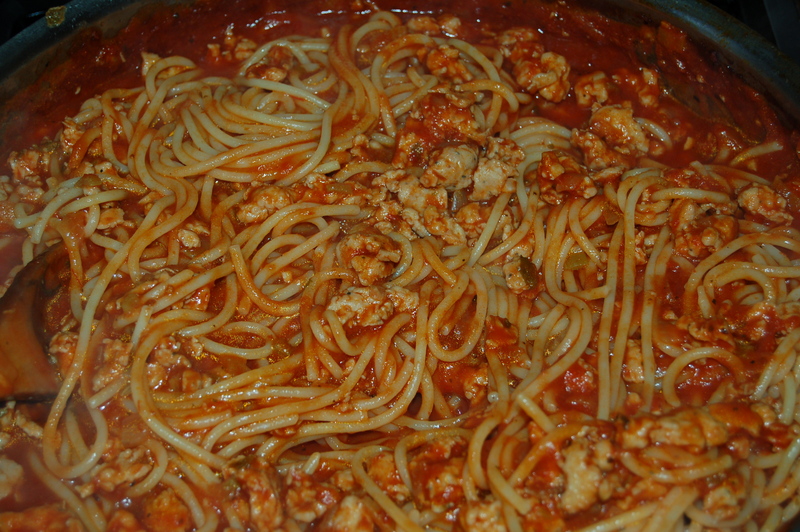 Add some of the reserved pasta water if you want to thin the sauce. 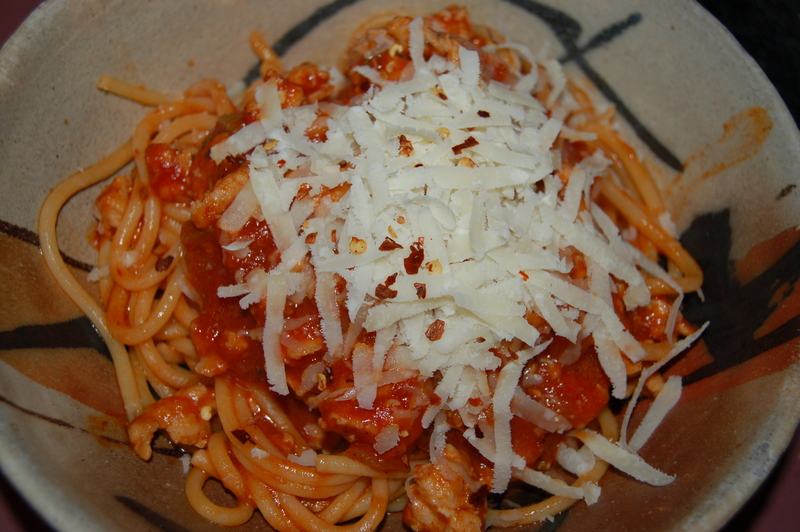 Serve in shallow bowls or big dinner plates with extra pepper flakes and Parmigiano Reggiano if you so desire. This entry was posted in dinners, Italy, Stuff I like and tagged balthazar bakery, bucatini, bucatini with ragu, chelsea, chicken ragu, chicken sausage, Eataly, Flatiron building, gragnano, italian sausage, Italy, manhattan, neapolitan pizza, New York City, nyc, pear juice, pizza, ragu, rigorosa, rigorosa pasta, san marzano tomatoes, sausage, sticky buns, succo di pera. Bookmark the permalink.